In the disastrous aftermath of the acquisition of PiperChat, Gavin Belson is fired and replaced with Jack Barker, who has found a way to prevent Hooli from paying the penalty from COPPA. Having learned that Jian-Yang’s app is actually about octopus recipes and not Oculus VR, Erlich hopelessly watches as he tries to pitch it to Coleman Blair Partners. During the meeting, Erlich manages to convince them that the app is like a “Shazam for food,” a concept that Raviga ends up investing in, as Monica, eager to see Laurie’s new right hand man Ed Chen fail, captures his attention by faking a phone call near him. This backfires when, after a dinner with Jian-Yang and Erlich, Chen finds out that they don’t have a working demo and retires from the project, suggesting that Monica be put in charge of it. 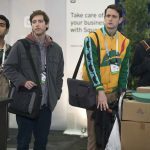 Erlich recruits Dinesh and Gilfoyle to help him build the non-existent app, refusing help from Big Head. Big Head, under pressure from his father to do something, applies to Stanford University but is rejected based on his mediocre transcript (showing five years at Arizona State without graduating). Once the admissions officer realizes who Big Head is, thanks to his Hooli promotions and media exposure, he ends up being invited to be a guest lecturer at Stanford’s Department of Computer Science. Dinesh dates a hacker, Mia, who is impressed with his takedown of Gavin. Mia, as it turns out, knows Gilfoyle from his online persona and also hates him. Meanwhile, Richard is obsessively thinking about his decentralized internet project and close to a breakthrough. After Monica tells him that the late Peter Gregory dedicated a lot of his time to a similar concept, Richard accesses Gregory’s archives. Even though Richard is excited that Gregory achieved some of the same conclusions as he did and that his notes will save him a lot of work, Jared finds out that the whole concept was patented in the name of Hooli years ago, when Gregory was founding the company in a garage with Gavin Belson and others. Richard is enraged, but ends up seeking Belson to meet with him.